Ballpark Basics: A brand new stadium, where the constant fly overs are almost as entertaining as the game itself. 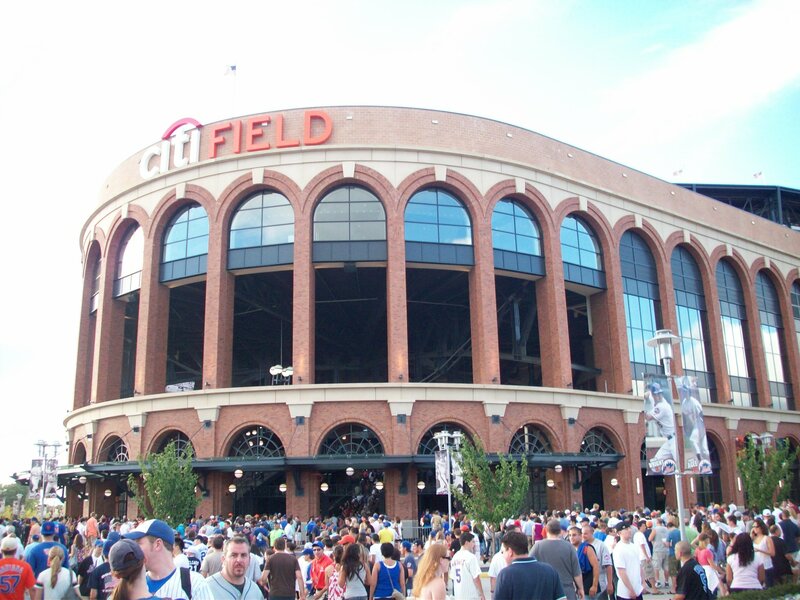 Ballpark Breakdown: In 2010 the Yankees moved into the new Yankee Stadium, and the “other” New York team, the Mets moved into Citi Field after spending 44 years at Shea Stadium. While Shea did not have the storied past of Yankee Stadium, many die-hard Mets fans have a strong attachment to their former ballpark. Both New York teams moving into brand new stadiums in the same year created a healthy dose of competition and comparisons. 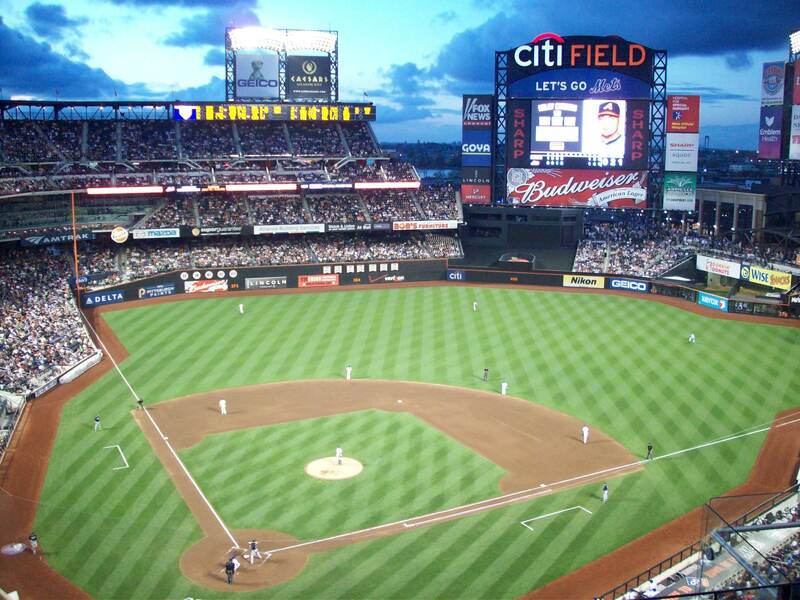 Just like the new Yankee Stadium, Citi Field was build right next to its team’s former home; you could even watch Citi Field being built right behind the outfield wall during the last season at Shea. 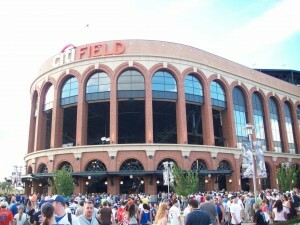 Both new parks carry vestiges of the old, Yankee Stadium brought Monument Park and the frieze with them in the move, Citi Field brought the Home Run apple (although the new one is four times larger than the original – becoming a true “big apple” and a hot meeting spot) and the constant flyovers courtesy of La Guardia Airport. Planes take off at a comical pace throughout the game and at times, it was more entertaining to see how close they would fly to the stadium, or bet on when the next one was coming, than it was to watch the game. 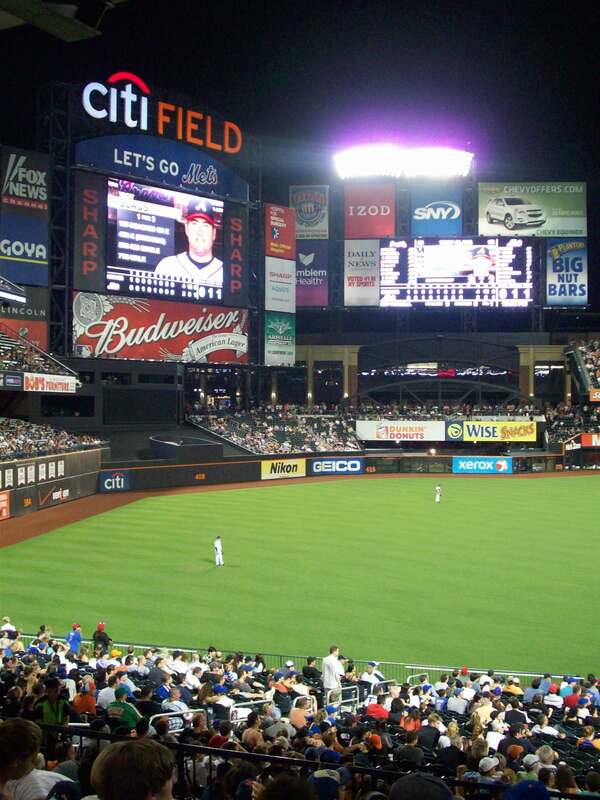 Lacking the individual history of the Yankees, when designing their new grounds the Mets chose to pay tribute to New York baseball history (think Giants and Dodgers), instead of focusing on the team themselves. The first and most obvious nod to baseball’s golden era is the Jackie Robinson rotunda when you enter. The middle of the rotunda contains his number, 42 formed from eight foot high steel. Etched into floor and archways of the rotunda are nine words – courage, excellence, persistence, justice, teamwork, commitment, citizenship, determination and integrity – words that Robinson lived by and exemplified. The façade is reminiscent of Ebbets Field, and the seats here are dark green as an homage to The Polo Grounds where the Mets first played as well as the New York Giants when they entered the league. There are other testaments to New York’s baseball past, but after many complaints that the stadium did not have enough Mets history, they have now added banners with former Mets greats as well as a new Mets Hall of Fame. Being the ugly step child of the two New York teams has its perks – as catching a game here is much more affordable, and we’re not just talking about the seats themselves. Citi Field boasts an extensive beer list from a variety of vendors, which for the most part are very reasonably priced; especially if you include typical New York inflation. We’re not saying that a game here is cheap by any means, but it won’t set you back as much as a Yankees game would. 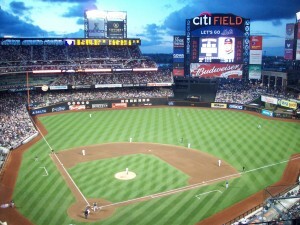 In some ways, taking in a game at Citi field is reminiscent of standing in Times Square – thanks to great field views from all angles in this new walkable stadium, there are people milling around everywhere; and the amount of advertising you are inundated with is unsurpassed by any other park we have visited (except perhaps Yankee Stadium itself). Brew Basics: a decent chain, with a variety of decent beers. The most unique and therefore identifiable characteristic of this brewery has to be the artwork. Each beer has its own unique logo, and you can find these on the glasses, taps, menus, wall posters, and even painted on the outside of their pubs. The brewery first opened in 1995 and was housed in what was originally a Borden Milk factory. 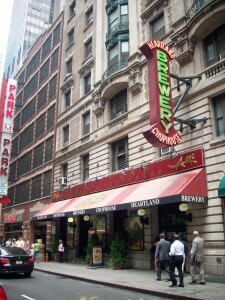 As their popularity grew, so has the business; they opened a new brewing location in Brooklyn in 2003, and today have seven restaurant locations in and around New York City. Because of the multiple locations (and the New York state of mind) the New Yorkers we know tend to write off this company because it’s a hotbed for tourists, and not a small, mom and pop that only locals know about. However, this is a company unique to New York, not only in location, but in design. Like many craft breweries, they keep a “green” frame of mind, and practice sustainability by sending used wort to local farms, using local products, recycling and most uniquely, only kegging their beer to avoid using individual packaging. Although all the Heartland Breweries have a pretty standard (generic) atmosphere that you would expect with a chain; they did put some effort into giving each restaurant their own attributes which make it possible to feel as though you’re visiting a different restaurant each time you enter a new location. The one that started it all is located in Union Square has the feel of a long, dimly lit hallway with lots of exposed brick and advertising painted directly on to the walls. The Seaport location has the exposed brick and murals on the outside, but the inside is wood paneled, lower ceilinged Cheers-esque kind of place. Meanwhile the HB Burger location looks like it’s centered in the city of London – with a 50’s diner style inside; and the outdoor seating and large awnings of the Radio City location provide the most generic chain-like look from the outside, which is immediately dispelled when you step in and are surrounded by the large, hand painted dark wood bar, the detailed intricate hunting pictures above and extensive collection of unusual-but-not-kitschy Americana. Indian River Light: (3.9% ABV) A light crisp beer, very pale in color but with a hint of an orangey hue. This beer was very light on malt, and had more of a fruity flavor than anything else. With a clean taste that was light and fizzy on the tongue, it went down pretty easily. Red Rooster Ale: (5.5% ABV) this beer was more of a deep toffee color than a really reddish amber, but was very palatable, and had a slightly nutty flavor and a hint of bitters. Nothing really to write home about, just a standard amber that was solid without being terribly unique. Summertime Apricot Ale: (5.75%) A good drink for a hot summer day, similar to the Indian River in that it is light and fruity, with a golden orange color. But the Apricot Ale comes with a higher ABV, and is more of an unfiltered brew, so it’s hazy. Obviously the biggest difference is the fruit, in this case it’s apricot (VERY apricot, especially in aroma) as opposed to the subtler citrus of the Indian River. Definitely sweet, we couldn’t drink two of these in a row without some kind of a palate cleanser. Farmer Jon’s Oatmeal Stout: (6% ABV) Heartland’s most touted multi-award winner, (they’ve even added medals around the neck of Farmer Jon into the artwork for this one) but its worthy of the hype. It was definitely the best option of those we tried, not horribly heavy, but thick and smooth on the palate with a rich brown color and taste that has hints of coffee, but is also slightly sweet.